I place the full extent of blame on Hideo Kojima. No man likes to milk the hype train more, and with such success, to the point now where nearly every single major developer feels the need to do the very same. We now hear of games years before they’ve thrown in the application form to license a game engine for their new IP. Harsh words? Absolutely. Applicable? You bet. But I fell for it for Sea of Thieves, though that was more because I was just so excited that Rare was coming back with a new game. That their trademark humour and design would be coming to a fleet of pirates in the open seas to plunder and pillage and scour the tropical isles for booty brought warmth to my cold heart and my brain went away singing songs from Muppet Treasure Island and humming the best pirate shanties this side of Johnny Depp. 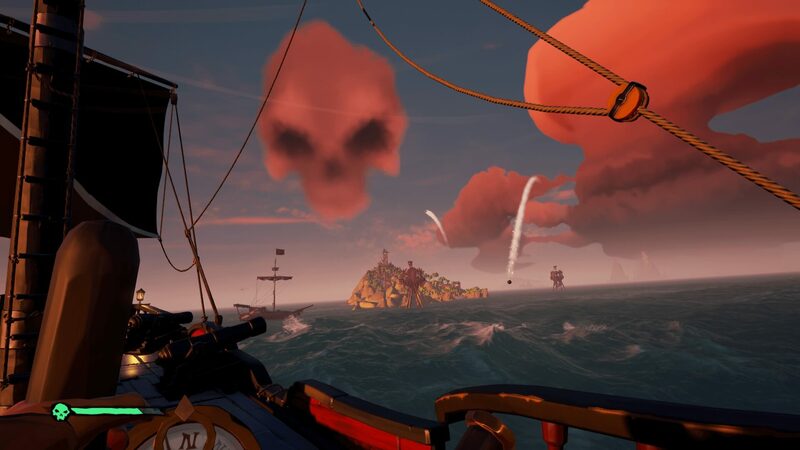 Sea of Thieves was to be the first Xbox exclusive game to be launched via the Xbox Game Pass. Whereas it was expected that people would have access to a large back catalogue of games (at time of writing, over 250), it definitely raised a surprised eyebrow when the news came along that any new games would join the pass at launch as well. That, on release, Sea of Thieves was so underwhelming caused a considerable groan as it seemed like Microsoft had, once again, committed another own goal. While it looked absolutely stunning, it was was launched with threadbare and repetitive content. Small server sizes didn’t help, with the chances of encountering another crew relatively minimal as well. The seas were mostly empty, with a smattering of fetch quests and some very questionable sword-fighting mechanics that, while extremely enjoyable when engaging in some ship-to-ship piracy, made for an incredibly lacklustre experience. I played it with friends intermittently when it was released and I utterly adored the absolutely stunning ocean, realistic weather and the jaw dropping sunrises and sunsets. However the whole experience was so empty I simply put it away for nearly 9 months with only an occasional glance of ‘what if’ when I scrolled past the icon on my Xbox Dashboard. This sentiment was echoed in our review back when it was released. 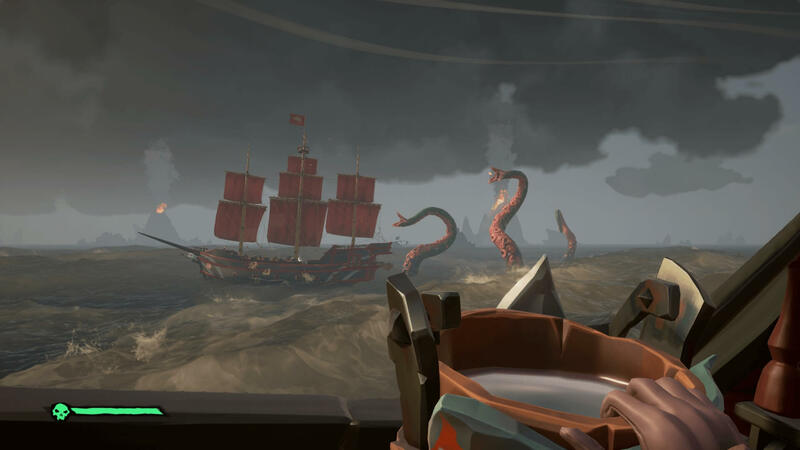 However, hindsight is 20/20, and it was clear that Sea of Thieves was always meant to have that open sandbox feel rather than be a strictly quest-led experience. The issue was that the pre-release hype just did not paint that picture and it left most players feeling extremely dissatisfied and dismayed. 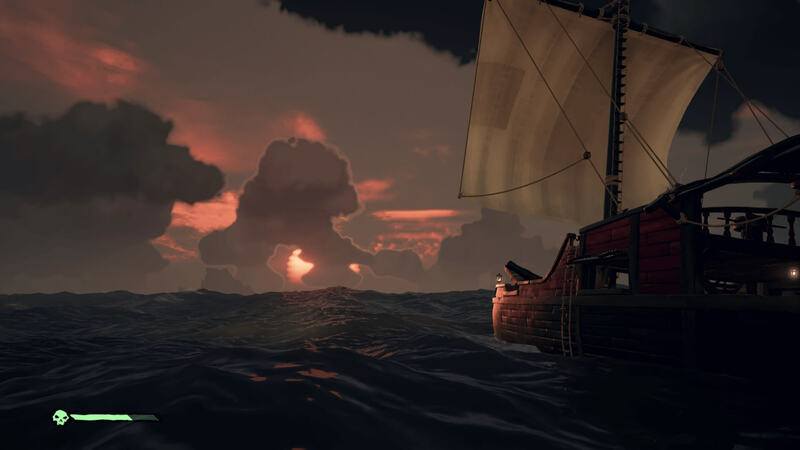 However, Rare kept plugging away with their plans, heroic levels of community engagement and building the world they had set to create - launching free content in the form of Hungering Deep (megalodon shark fights! ), Cursed Sails (skeleton/ghost pirate ship-to-ship battles! )and The Forsaken Shore (Y’know what makes the open ocean more dangerous? VOLCANOES). And now ho, boy — if anyone ever wonders why any article I’m writing for Jump Dash Roll is running late (busted! - Ed), it’s because nowadays I’m more than likely peg-leg deep in plundering for booty while simultaneously ramming my beautiful brigantine into some scurvy dogs for some plunder (and/or the ‘lulz’). I cannot begin to describe what a joy this game has become to play. 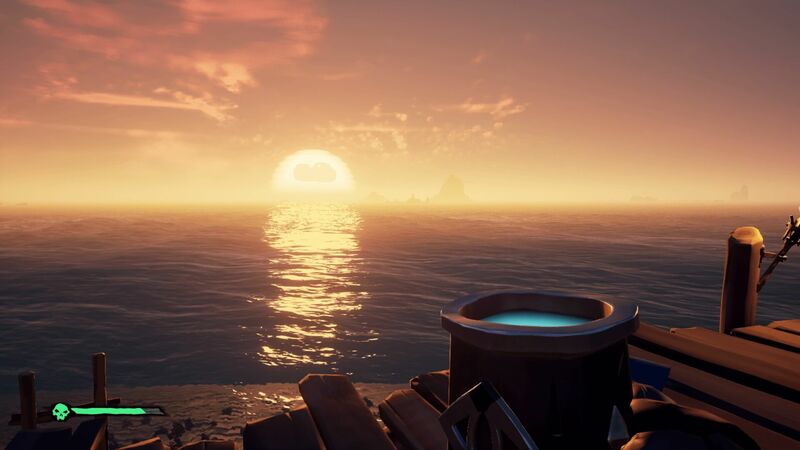 More so than almost any other game (Mass Effect being the only other example), Sea of Thieves allows me to just lose myself in the landscape and find some modicum of tangible excitement. I have a very real sense of happiness when I boot it up and the soundtrack kicks in (whether that be jaunty or sombre), then as the world loads and I hear the gentle splashing or roaring storm under the backdrop of yet more perfectly thematic music. Even the banality of hauling supplies onto your ship has an underlying sense of giddiness as you ready your crew for its next adventure. Of course it can be rightly argued that all this content now should have been available at launch, but then we have to be similarly honest in the sense that content takes time to create. Clearly Rare sought to create the world first, and my god is it a beautiful one. There is exquisite detail in its ambient lighting effects, the creaking and groaning of your ship as it battles raging storms and begins to take on water and the screaming of near-miss cannonball volleys. It’s hard not to be taken aback as a blood red sunset crests on the horizon as you crash through crystal blue waters. It’s harder still not to curse fluently as thick fog curls around your ship, as rocks hide mere inches from your hull, inky blackness becoming as deadly as cannon fire. The environment is the game. With this steadfast momentum, what can we hope to see from Sea of Thieves one year on? 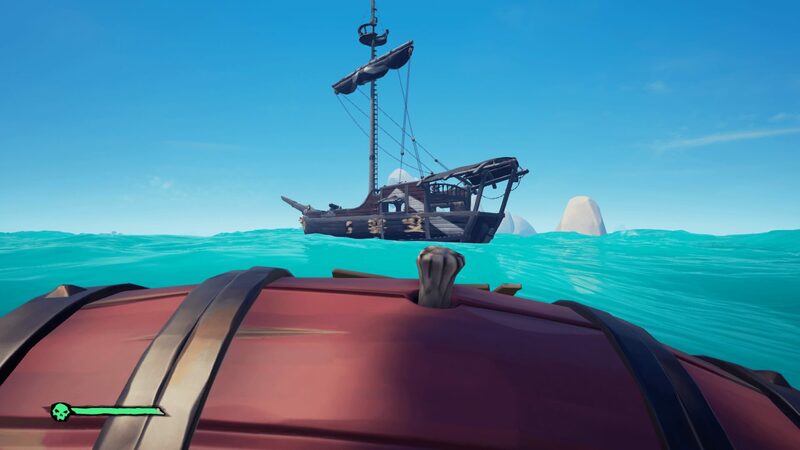 Rare has just today announced that two new DLC contents will drop on April 30th with The Arena, which focuses on PVP battles and Tall Tales which, by the looks of things, is a campaign mode. Not only that but more intricate ship battle damage is coming (disabling ships by blowing up masts), as well as fishing and hunting coming to the fore of gameplay as well. This is not to mention a flood of new items, clothing, consumables and cosmetics. For regular players this is a fine excuse to continue our thirst for adventure, but for new players too, this just adds more things to play with in the toy chest. So one year on, Sea of Thieves is clearly the game it wanted to be from day one. It was a gamble to drip-feed content, to be sure, but its slow burn build in popularity has paid dividends — it now benefits from an incredibly loyal player base that utter devours any and all content, no matter how small, and sits increasingly higher in the most popular games to stream. Whether or not this was always the intention, only the boardroom will know, but I’ll wager it was given how incredible Rare has been at actively engaging the community with weekly updates, interactions and communication — and doing it with such raw enthusiasm it must be said! There’s one or two games I could mention that could learn a thing or two from Rare’s example. Wink wink, nudge nudge. Sea of Thieves is by no means perfect. I still absolutely hate the swordfighting, the update to remove crossplay between console and PC cannot come quick enough (flicking your wrist to aim quickly is an unfair advantage — don’t get me started on this), more ship customization is sorely needed and a larger map overall really wouldn’t hurt. But it’s a game that is growing organically, giving content to players who want to carve out an adventure in some spare hours after the daily grind of life and work. I am a huge fan of tabletop roleplaying games, and in Sea of Thieves, I see a great influence taken from them. 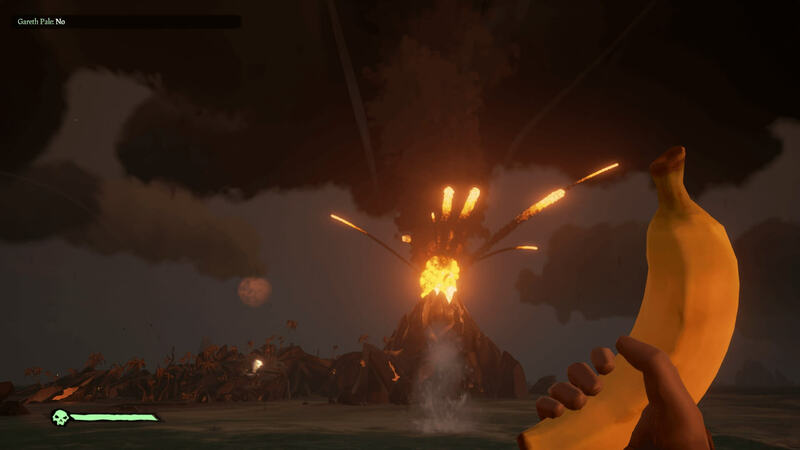 Rare has merely given players a world to do what they wish in, and a few tools (for now) in which to do it. The world is set to change in a big way on April 30th, and I, for one, am incredibly excited to see what the next year brings.